There's a reason Netflix shares have exploded again this year. Netflix Inc (NASDAQ:NFLX) is supposed to be a maturing company. The company completed its global expansion last January with a simultaneous launch in 130 countries, and it then promised to begin delivering material profits this year. The implication seemed clear. With no more markets to enter, growth would moderate, and the company would have to demonstrate profit growth in order to satisfy shareholders. Investors, like myself, who expected growth to steady or even decelerate over the coming years have been pleasantly surprised. Based on its subscriber numbers, Netflix is growing faster than ever. For the second quarter in a row, the leading streamer crushed its own subscriber forecasts in its third-quarter earnings report Monday, posting net subscriber additions of 5.3 million, much better than 3.6 million a year ago and its own projection of 4.4 million. In the second quarter, the company added 5.2 million members against a forecast of 3.2 million and just 1.7 million new subscribers the year before. That recent surge shows the strength of Netflix's model and the global popularity of its original content. As you can see from the chart above, subscriber growth has surged over the last two quarters as the company has added 22.5 million members over the last four quarters, nearly doubling the growth it was experiencing three years ago. New member additions have been strong across the board as the company has added 5.3 million domestic subscribers during that time, just slightly below its average over the last five years even as the domestic market is reaching maturity. In fact, during the seasonal slow summer quarters, the second and third, the company added 1.92 million subscribers in the U.S., a number tied with 2013's for its best performance ever during that period. That shows that Netflix's programming is increasingly attracting new subscribers, keeping the streaming company from having to rely on the seasonal increase in TV time. Meanwhile, international growth is exploding, with 17.2 million new members over the last year, and is on track to increase by more than 20% over the year before. International subscriber growth has risen every year since the company launched in 2010, and this year's performance shows the company doesn't need new countries to expand in in order to keep up that momentum. That subscriber growth has propelled revenue increases to a pace not seen since 2011, before Netflix was forced to separate the DVD and streaming businesses. 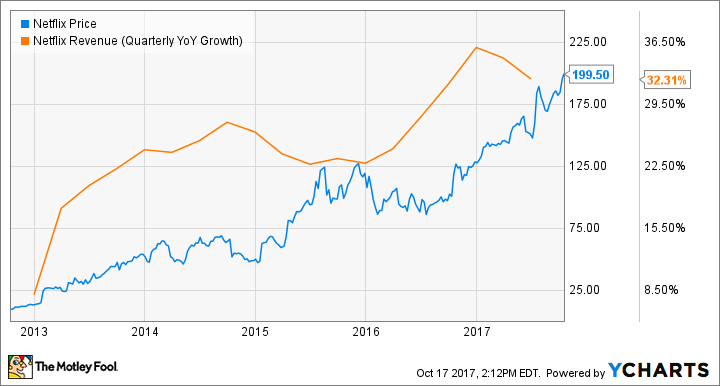 As the chart above shows, quarterly revenue growth peaked in the fourth quarter of last year as Netflix finished implementing price hikes, and though the quarterly pace has slowed each quarter this year, the figure for the trailing 12 months is essentially the highest it's ever been. For 2017, the company is headed for better than 32% revenue growth, its fastest annual pace since 2011, and with the recently announced price hike going into effect, revenue growth should accelerate next year. Netflix shares fell slightly after Monday's earnings report, but that was more of a moderation to the surge after the company announced a price hike earlier this month. The stock is still up 9% over the last month and 61% year to date. While there are legitimate concerns about the company's increasing debt load and the risk of losing licensed content, Netflix continues to execute flawlessly. The service has over 100 million members globally, is challenging HBO for supremacy at awards shows, and is expanding its already unmatched content library. Netflix investors can celebrate after the latest report. Rather than maturing, the company may just be hitting its golden age.